CivilizationThe earliest architecture that anyone knows about from India dates to 3300 BC-1300BC in Indus Valley Civilization and more particularly from 2500 BC, in the Harappan period in northern India (modern Pakistan). The Harappans built big cities, with walls around them and public baths and warehouses and paved streets. But when Harappan civilization collapsed, about 2000 BC, almost two thousand years went by before anybody in India built a big stone building again. When Indian architects did begin to build big buildings again, about 250 BC, at first they built them of wood. Nobody in India knew how to build big stone buildings so they wouldn't fall down. Architects started by building solid stone buildings, basically mounds of dirt covered with brick or stone like the earlier ziggurats in West Asia and the pyramids in Egypt. People called these buildings stupas. Soon after this, about 200 BC, architects began to carve Buddhist temples into the sides of cliffs, so they were taking away stone instead of building with stone. This is easier, so it was a good place to start. Rock-cut architecture was first perfected by the Buddhists, and was followed by several Hindu rulers. 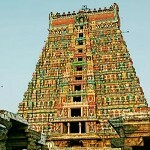 In Southern India, the Pallavas excelled in this art form. The sculptures or idols in temples are made of granite and the Utsava idols are made of bronze and panchaloha. Apart from these, there are the huge Iyyanar statues and horses exist in South Indian villages. But under the Guptan Empire, about 350 AD, Indian architects finally began to build stone temples. These were mainly Hindu temples. Between 350 and 1000 AD, architects built better and better stone temples, especially in southern India, while in northern India they kept on cutting more temples into the side of cliffs, at Ellora and Elephanta. Slowly Indian architects got better at building temples. Around 500 AD, architects began to use mortar to hold the stones together. Temples got columns around them, and towers over them. About 1000 AD, Indian architects began to replace wood beams with iron beams. The Indus Valley Civilization (IVC) was a Bronze Age civilization (3300-1300 BC; mature period 2600-1900 BC) that was located in the north-western region of the Indian subcontinent. The Indus Valley is one of the world's earliest urban civilizations, along with its contemporaries, Mesopotamia and Ancient Egypt. The civilization is noted for its cities built of brick, roadside drainage system, and multi storied houses. The baths and toilets system the cities had is acknowledged as one of the most advanced in the ancient world. The grid layout planning of the cities with roads at exact right angles is a modern system that was implemented in the cities of this particular civilization. The urban agglomeration and production scale of this particular civilization was unsurpassed at the time and for many future centuries. The mature phase of this civilization is known as the Harappan Civilization, as the first of its cities to be unearthed was located at Harappa, excavated in the 1920s in what was at the time the Punjab province of British India (now in Pakistan). Excavation of Harappan sites has been going on since 1920, with important breakthroughs occurring as recently as 1999. To date, over 1,052 cities and settlements have been found, mainly in the general region of the Ghaggar-Hakra river and its tributaries. 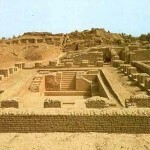 Among the settlements were the major urban centres of Harappa, Lothal, Mohenjo-daro (UNESCO World Heritage Site), Dholavira, Kalibanga, and Rakhigarhi. Fortified cities with stupas, viharas, and temples were constructed during the Maurya Empire (c. 321-185 BC). Wooden architecture was popular and rock cut architecture became solidified. Guard rails-consisting of posts, crossbars, and a coping-became a feature of safety surrounding a stupa. Indian The toranaTemples-build on elliptical, circular, quadrilateral, or apsidal plans-were constructed using brick and timber. The Indian gateway arches, the torana, reached East Asia with the spread of Buddhism. Some scholars hold that torii derives from the torana gates at the Buddhist historic site of Sanchi (3rd century BC - 11th century AD). Rock-cut step wells in India date from 200-400 AD. Subsequently, the construction of wells at Dhank (550-625 AD) and stepped ponds at Bhinmal (850-950 AD) took place. The city of Mohenjo-daro has wells which may be the predecessors of the step well. As many as 700 wells, constructed by 3rd millennium BC, have been discovered in just one section of the city, leading scholars to believe that 'cylindrical brick lined wells' were invented by the people of the Indus Valley Civilization. 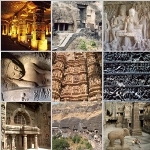 Ajanta and ElloraCave temples became prominent throughout western India, incorporating various unique features to give rise to cave architecture in places such as Ajanta and Ellora. Walled and moated cities with large gates and multi-storied buildings which consistently used arched windows and doors are important features of the architecture during this period. The Indian emperor Ashoka (rule: 273-232 BC) established a chain of hospitals throughout the Mauryan empire by 230 BCE. One of the edicts of Ashoka (272-231 BC) reads: "Everywhere King Piyadasi (Asoka) erected two kinds of hospitals, hospitals for people and hospitals for animals. Where there were no healing herbs for people and animals, he ordered that they be bought and planted." Buddhist architecture blended with Roman architecture and Hellenestic architecture to give rise to unique blends-such as the Greco-Buddhist school. Indian art and culture has absorbed extraneous impacts by varying degrees, and is much the richer for the exposure. This cross fertilization between different art streams converging on the subcontinent produced new forms that, while retaining the essence of the past, succeeded in the integrating selected elements of the new influences. Mauryan empire's SanchiMaru-Gurjara Temple Architecture originated somewhere in sixth century in and around areas of Rajasthan. Maru-Gurjara Architecture shows the deep understanding of structures and refined skills of Rajasthani craftsmen of bygone era. Maru-Gurjara Architecture has two prominent styles Maha-Maru and Maru-Gurjara. Scholars such as George Michell, M.A. Dhaky, Michael W. Meister and U.S. Moorti believe that Maru-Gurjara Temple Architecture is entirely Western Indian architecture and is quite different from the North Indian Temple architecture. There is a connecting link between Maru-Gurjara Architecture and Hoysala Temple Architecture. In both of these styles architecture is treated sculpturally. Temples of TamilnaduThe South Indian temple consists essentially of a square-chambered sanctuary topped by a superstructure, tower, or spire and an attached pillared porch or hall (ma? ?apa, or ma? ?apam), enclosed by a peristyle of cells within a rectangular court. The external walls of the temple are segmented by pilasters and carry niches housing sculpture. The superstructure or tower above the sanctuary is of the ku?ina type and consists of an arrangement of gradually receding stories in a pyramidal shape. Each story is delineated by a parapet of miniature shrines, square at the corners and rectangular with barrel-vault roofs at the centre. The tower is topped by a dome-shaped cupola and a crowning pot. North Indian temples showed increased elevation of the wall and elaborate spire by the 10th century. 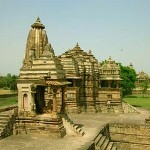 Richly decorated temples-including the complex at Khajuraho-were constructed in Central India. Indian traders brought Indian architecture to South east Asia through various trade routes. Grandeur of construction, beautiful sculptures, delicate carvings, high domes, gopuras and extensive courtyards were the features of temple architecture in India. Examples include the Lingaraj Temple at Bhubaneshwar in Odisha, Sun Temple at Konark in Odisha, Brihadishwar Temple at Thanjavur in Tamil Nadu.